It’s a curiosity that both Michelangelo and Francesco Da Milano were nicknamed ‘il divino’. With the former, we can see his massive and revolutionary works, the Sistine chapel, the sculptures and some other great paintings. He is known the world over and considered one of the greatest artists of all time. Milano whose full name was Canova da Milano is really a shadowy figure who only wrote for the lute and whose art is now forgotten except by a few musicians. How has this happened? Milano, born in Spain, was a great improviser. The detailed booklet notes by Peter Croton himself, quotes an account of the composer at a banquet at first beginning “to seek out a fantasia” whilst everyone falls silent. Then he transports the listeners so that they become “deprived of all senses” and in a “divine frenzy”. This, by our expectations, is subtle music, a slight fall or rise of melody or an unexpected harmony and an especially memorable phrase or dynamic change. All of these were enough to capture the attention of a large gathering. In our own times when musical expression tends to be on a grander, louder, lengthier scale than a three-minute fantasia we have lost the art of careful listening in which small details of expression can mean such a lot. In addition it is quite probable that the best improvisations were never recaptured on manuscript. So we will never know if the lutenist really warranted his sobriquet. Francesco’s music has been recorded by others over the years. 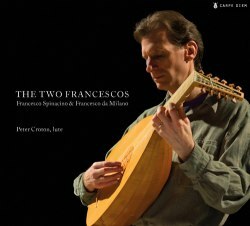 I reviewed a disc played by Hopkinson Smith (Naïve E8921) in 2008 but to my knowledge this is the first time Milano and Francesco Spinacino have been linked on one CD. His music is quite different and we are given a set of ten Ricercar here. Spinacino could almost be described as the Gesualdo of the lute and his music has been pronounced as ‘chaotic’. The opening track sets the tone. Number 30 begins with something like six bars of a triple-time dance before suddenly planting an unrelated chord into the mix then bouncing back to where it started. There are some other modulations and although only 3.40 secs in length, another mood, a more reflective one is begun after just two minutes. There are several sequential passages. The opening music is never fully re-established but ideas are developed and then set aside. The reason for all this is that Spinacino was an improviser and is really attempting to capture those free-wheeling ideas, which so “excited the ears of his first audiences”. No. 31 is even more curious. It starts off as if it is warming up and “seeking out an idea”. Then there is a passage which goes into a strangely unrelated key and winds back on itself. The whole piece has no definite focus; this sort of thing happens in other pieces and it’s quite difficult to get a handle on the style. I agree with Croton that no “established method of analysing the music to guide interpretative decisions may necessarily do the music justice”. Even so, it’s quite intriguing that Petrucci chose Spinacino’s music to head his famous collection ‘Intablatura de Lauto’ published in Venice in 1507 whence these pieces come. Francesco da Milano is much more of a classicist one might say and Croton’s selection of pieces here offer us an opportunity to compare the Ricercar form with that of the Fantasia. As a general rule, although I would not to be pinned down to this, the Fantasia tends to begin with what we now think of as a fugal or imitative idea. This is passed between the voices of the instrument. Think of it, almost as canonic. Typical is the Fantasia No. 32, which is clubbed together with numbers 31 and 61 on the same track. The opening tune is kept constantly in the mind either as a melody or as a rhythm. In the Ricercar, surprisingly you might think, the form is more relaxed and can be quite dance-like as in number 91.These pieces may also be shorter and can also seem to penetrate a deeper emotional landscape as in number 84 although they are still basically contrapuntal with just a little chordal work. Milano also composed variations on popular songs and Pavans but these Ricercar and Fantasias do allow the listener to get to know his language well. Peter Croton plays an elegant and warm sounding six-course lute made in 1992 by Michael Lowe. Lowe contributes a fascinating essay about the history of the instrument and his approach in constructing the one used here. Croton complains in his booklet notes that he was extremely cold when making this recording in the Swiss Church (pictured within). You would never expect it from his clear and deft finger-work. I know from organ playing in cold churches how painful it can be. The microphone is closely placed and there is little sense of the acoustic of the building. Perhaps because of the cold Croton did not record as much music as he had possibly intended because at less than fifty minutes the playing time is distinctly stingy. The music is however delightful and fascinating. The combination of these two composers offers a chance for us to realise that renaissance styles could be as varied and as poles apart as any in the romantic or modern era once we listen with different ears and a gentler spirit.